924Board.org :: View topic - Looking for a small (190mm) clutch to fit 931 driveshaft. Posted: Wed Nov 20, 2013 5:02 am Post subject: Looking for a small (190mm) clutch to fit 931 driveshaft. I have a 110hp engine that has 190mm clutch and a small-ish flywheel, that's going into an 82 931 chassis with stock torque tube. So far, the best I could come up with is 1.7l VW Quantum clutch, 200mm. Is there something slightly smaller available? I don't have a lot of extra room in the pressure plate, the Quantum clutch would have to be turned down and I'd rather have an off-the-shelf solution. This is for 24 Hours of Lemons, if anyone's wondering about such an engine choice. The 931 uses the larger, more common clutch spline that mates with some Chrysler and Ford splines. Might be worth looking there. You could also contact some clutch manufacturing companies directly as they should be able to look at their catalog and see if there is something that will meet your needs. Ok, good call - I had spline count all messed up. My actual best bet is a standard 2.3l Ford clutch, 197mm. Nissan 190mm 23-spline clutch ALMOST fits, but it's 1.031 instead of 1", so I'm assuming it's a no-go. Now, the next question. I know the inner bore of the torque tube is 77mm. I don't know how big the four holes are, though, or where they're placed in relation to the torque tube centerpoint. I looked but couldn't find it - is there a guide somewhere, or does anyone know what diameter/position the holes are? I'm assuming my bellhousing should be 6.4" deep, flange-to-face. Does that sound about right? What engine exactly will you be running? Something more common and more easily modified would be nice. Why don't you just drill out the splined center from a 931 clutch and install it in place of the 197mm clutch you found??? I want to avoid drilling/riveting unless I know the old and new clutch centers will match up exactly (in which case, I'd be all set). Do companies like Sachs use a common center section pattern for this? Most certainly this will be a common engine. We wanted something available, cheap, strong, EFI, that doesn't require an oil cooler, good gas consumption when beating on it (our other car with the same motor gets 3gal/hr burn rate, it's incredible), and something we're already familiar with. Draw a rectangle that measures 3.490" x 2.920". At each corner put a 1/2" diameter circle. 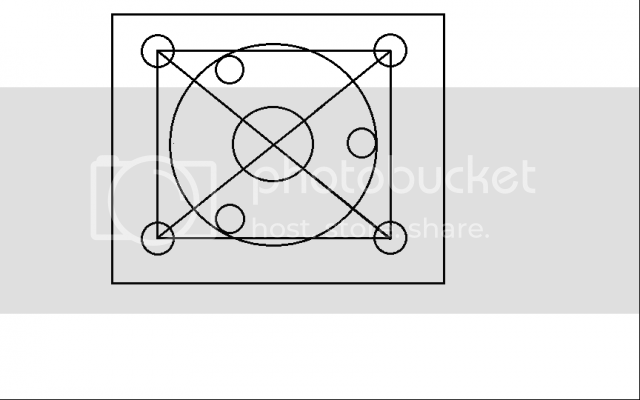 The tip of each corner of the rectangle should be in the center of each circle. Now you have a bolt hole pattern. The driveshaft passes through the exact center of the rectangle. Don't overlook the fact that there are three centering dowels that form a triangle pattern on the back of the bell-housing or adapter plate. These fit snugly in the inside bore of the torque tube. The above pattern is for a 944 torque tube. I don't know if the 931 is the same or not. Some pics of an adapter plate with the mentioned dowels. 931 and 944 share the same bellhousing, so torque tube pattern is also the same. Uh, no. No they don't. 924/931 share the same bell housing pattern. The 944 is completely different. The 4-bolt pattern from the bell housing to the torque tube is the same though. Yeah, bell housing itself is different where it bolts to the block (duh! my bad! )...but otherwise identical: same torque tube (for 81-82 931), same torque tube flange, same clutch slave, same starter, same clutch fork, same clutch fork bearings, pin, etc. etc. The torque tube bolt pattern and ID is the same on all of the 924/944/968 cars. I made a drawing similar to this to help me.